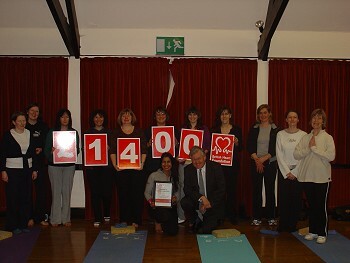 With the help of the Eccles and Monton community, Sadhana Ali, a well known, local Yoga and Pilates teacher raised an incredible £1400 from her annual Charity Yoga Day which took place on 1st November 2008. All ages and abilities took part in a sponsored Yoga Day, baking cakes, samosas and doing a day of Yoga. Sadhana Ali, says “it was an overwhelming response to the day, children as young as 3 years old and older yogis took part doing what they can to raise funds for the BHF”. Sadhana explains that her dad, Moboshir Ali aged 65, has lived in Eccles since 1980. He has had four heart attacks and a heart bypass over the last few years as well as suffering from chronic renal failure since the age of 14. She says that "Although my father’s heart is not going to get any better, he continues to lead a good life with improved diet , more exercise and the benefits of yoga. He remains an active part of the local community and a key volunteer at the Eccles Mosque on Trafford Road." According to Sadhana, the BHF has been an invaluable support for her father by providing information on how to cope with life following heart attacks, and by their commitment to educating people on the risks of heart problems and the importance of a healthy lifestyle. She was determined to give something back to the BHF. She says her father's passion for life and his sense of selflessness has been an inspiration to her throughout my life. "Combined with my Yoga it is this wonderful energy and consideration for other people that I wish to share with the local community as part of the Sponsored yoga day to say thank you to the BHF. We hope that lots of people will join us and share the positive energy of the occasion, showing that yoga is about helping others and giving back to the community. " Sadhana Yoga and Pilates is now in its third year, and provides classes for all bodies and any body – the day was to show that anyone can take part, its not about sticking legs behind head and wanting to look like the celebrities but to enjoy the body and appreciate what we have before its too late. To date we have raised over £3000 for the BHF and Hope Hospital’s renal unit, which was to thank the hospital for its support in helping her father with his renal dialysis.